256 pages | 27 B/W Illus. 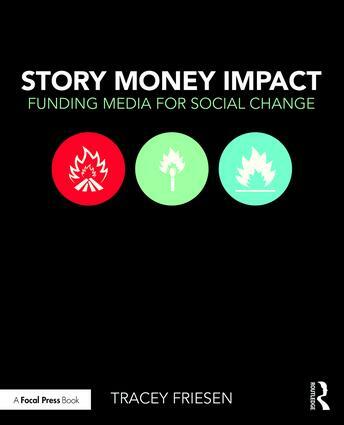 Story Money Impact: Funding Media for Social Change by Tracey Friesen is a practical guide for media-makers, funders, and activists who share the common goal of creating an impact with their work. Today, social-issues storytellers are sharpening their craft, while funders with finite resources focus on reach, and strategic innovators bring more robust evaluation tools. Friesen illuminates the spark at the core of these three pursuits. Structured around stories from the front lines, Story Money Impact reveals best practices in the areas of documentary, digital content, and independent journalism. • Twenty-one stories from people behind such powerful works as CITIZENFOUR, The Corporation, Virunga, Being Caribou, Age of Stupid, and Food Inc.
• Six key story ingredients for creating compelling content. • Six possible money sources for financing your work. • Six impact outcome goals to further your reach. • Seven practical worksheets for your own projects. • A companion website located at www.storymoneyimpact.com containing up-to-date information for those seeking the tools and inspiration to use media for social change. STORY IS FUEL: Generates Feeling! MOTIVATION: Why Use Art to Make Change? Elise Pearlstein, Participant Media, Food, Inc.
MONEY IS WIND: Driven By Mission! MOTIVATION - Who Will You Make Change With? IMPACT IS FIRE: Igniting Movements! MOTIVATION - What Kind of Change Do You Want? Tracey Friesen is a media strategist, committed to supporting storytellers and social innovators in the creation of impactful content. Formerly an Executive Producer of the National Film Board of Canada’s studio in Vancouver, her credits include ScaredSacred, SHAMELESS: The ART of Disability, and Force of Nature: The David Suzuki Movie. In 2014 she wrote a major research paper for the Documentary Organization of Canada called Growing the Pie: Alternative Financing and Canadian Documentary, a feasibility study on collaborative funding models for Inspirit Foundation, a research project -­- with support from Creative BC -­- on the viability of a Canadian-based Good Pitch, and the documentary film Amplify HER. Friesen is now Director of Programming for Roundhouse Radio 98.3 Vancouver, a hyper local commercial station with a community focus.